[prMac.com] St. Julians, Malta - Independent development team, CoreCode today is proud to announce the release and immediate availability of MacUpdater 1.4.3, the extensive update to their popular app updating utility for macOS. MacUpdater scans any Mac's Application folder, quickly identifying installed applications that have updates available. Apps are then updated with just a few clicks of the mouse. The new version of MacUpdater is a significant update, adding the ability to update multiple apps at once, allowing in-progress updates to be cancelled, and users can make backups of old apps and downloaded installers. The app also improves the ability to show the correct "latest version" for users that are running a beta of the app they wish to update. "While downloading and updating apps from the Mac App Store is a convenient and efficient way to keep your Mac's apps up to date, it doesn't include a way to track and update apps downloaded and installed from other sources," says CoreCode marketing manager Brigitte Zmoelnig. "MacUpdate removes the burden from users of manually checking their apps one-by-one for updates. Plus, version 1.4.3 streamlines the process even more, with great new features, even the ability to update multiple apps all at once!" MacUpdater runs quietly in the background, checking installed Mac apps for updates on a daily basis. The utility notifies users when updates are available. Users can also manually scan their apps for available updates. Filtering options allow users to display only outdated apps, or to ignore apps they don't wish to update. As of version 1.4.3, users can adjust the height of the MacUpdate window, allowing them to view a longer list of their apps, making it easier to select multiple apps for updating. Plus, the new info-button allows users to quickly view release notes and other information about the updates. Users will also be glad to learn that MacUpdater can now make backups of the old version of the app, which will come in handy in case they aren't happy with the app's updates. Backups of the downloaded installation programs can also be made, making it easy to reinstall apps if needed. MacUpdater not only checks for available app updates, in most cases the utility can also download and install the update for you. 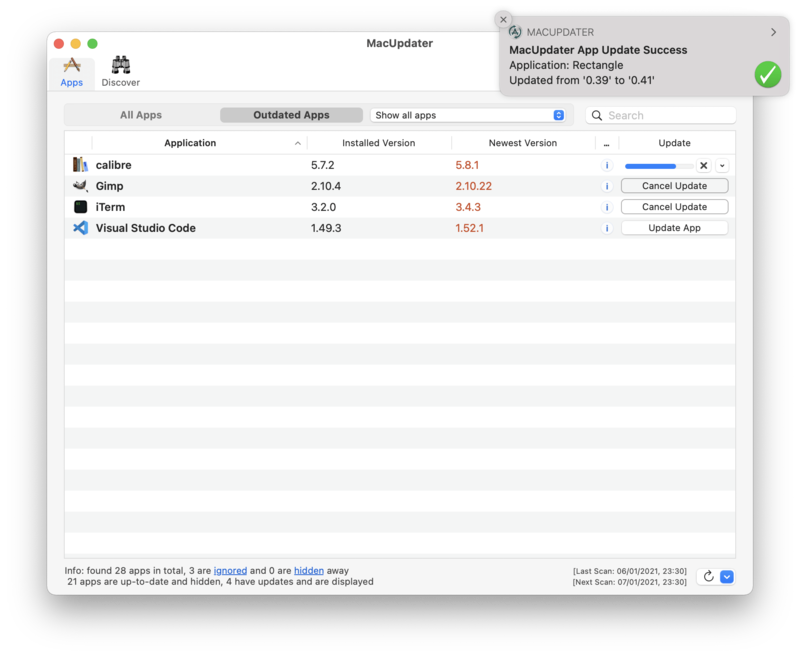 When MacUpdater can't automatically update an app, it can launch the app's updater for you. The app even detects when Mac App Store apps need an update. While MacUpdater can't update those apps, it can open the Mac App Store, allowing users to update their apps inside the Store. Even more, MacUpdater is able to show you updates to major new versions of your installed apps that have been uploaded as separate new apps to the store, which is something that the Mac App Store itself can not do. 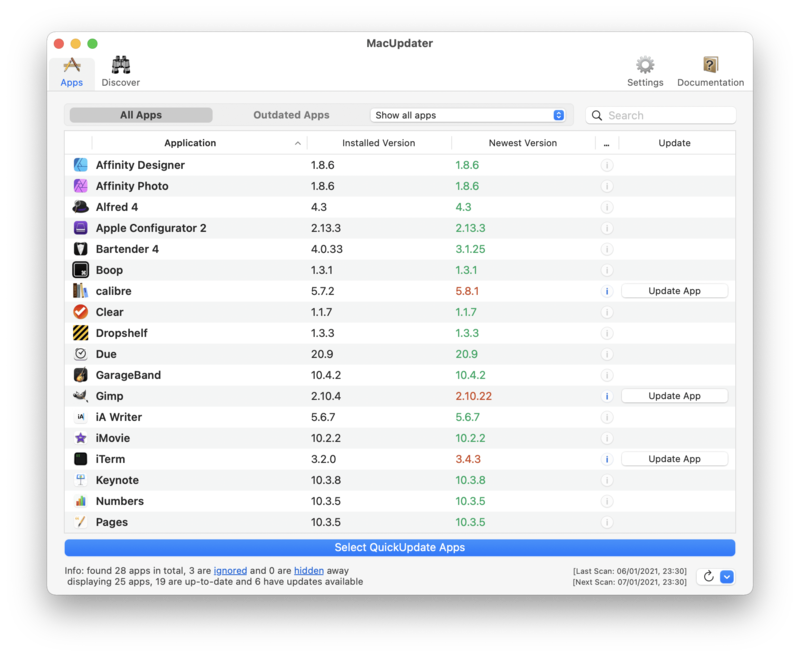 MacUpdater can detect available updates for more than 37,500 apps, and the list is growing every day. The app can automatically update around 2,500 popular apps with the click of a button on the updates release date. 5,000 other apps can be auto-updated within a few days of their release. 30,000 apps can be scanned for updates, but cannot as yet be updated from within MacUpdater, this is because some application vendors, including Microsoft and Adobe, don't allow updates outside of their closed systems. However, the CoreCode team is working on that, so stay tuned. "MacUpdater ensures your Mac's installed apps stay up to date. And with our new multi-update feature, users can update multiple apps at once, saving their valuable time," says product manager Jamie Stevenson. "Our users tell us they already loved the app, and we've used their terrific feedback to make the app even better. Plus, more new features are on the way, and we can't wait to share them with you!" MacUpdater 1.4.3 is a free download and is available worldwide exclusively through the CoreCode website. Users can scan for updates for free and update up to 10 apps for free. Users can pay $9.99 USD (or an equivalent amount in other currencies) to unlock the ability to update additional apps. Review copies are available upon request. Headquartered in St. Julians, Malta, CoreCode has been developing Mac software since 1998. The development team specializes in building awesome apps for macOS and iOS. The company offers a variety of free and commercial applications, with over a dozen commercial apps offer for sale and over two-dozen open source apps released to Mac users. All Material and Software (C) Copyright 2019 CoreCode. All Rights Reserved. Apple, the Apple logo, Macintosh Mac OS X and macOS are registered trademarks of Apple Inc. in the U.S. and/or other countries. Other trademarks and registered trademarks may be the property of their respective owners.